Brimming with Asian fusion flavors, this braised vegetable and chicken dish certainly warms things up on a cold winter’s day. 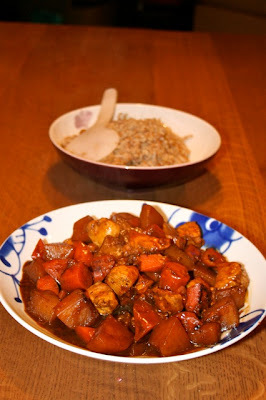 I was looking for a hearty stew-like dish to accompany some cooked barley and bulgar wheat. 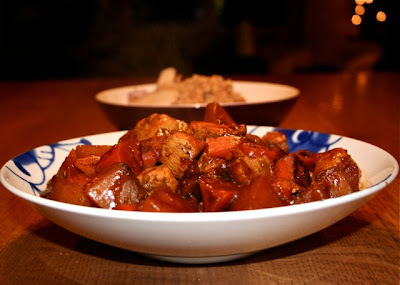 While foraging around in my fridge I found some boneless skinless chicken breast, carrots and a big fresh daikon radish. 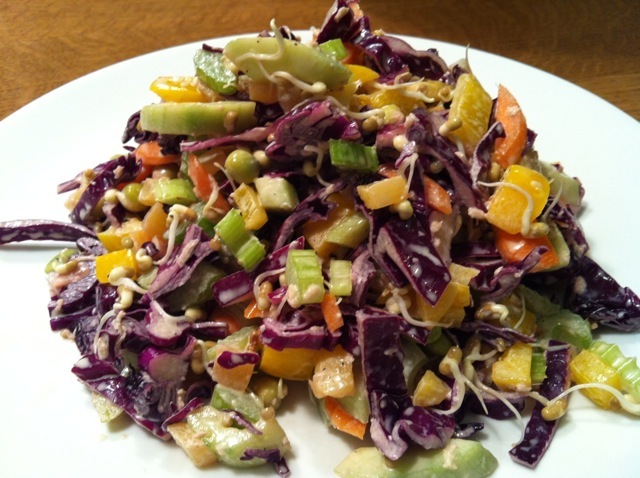 Sweet vegetables require a savory, sweet and flavorful sauce. 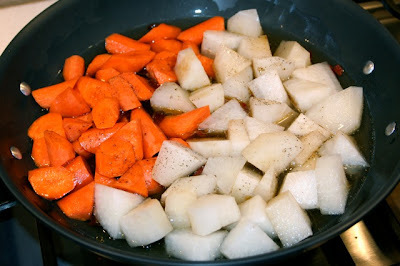 I knew I wanted to do a braise and let the root vegetables get nice and tender sweet. The only question that remained was how to season the dish. I opened up my cupboard of Asian goods and found some of this fish flavored dashi powder. 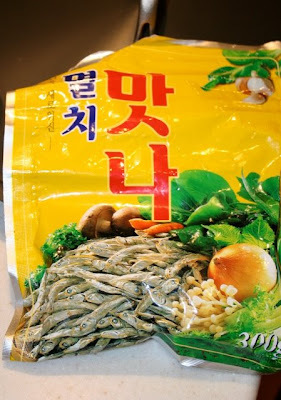 This is like Korean bullion but made with fish, not beef or chicken. That provided a nice undercurrent of flavor. 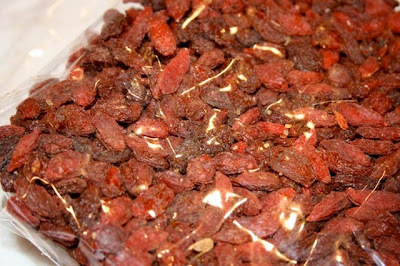 I also spied my bag of dried Chinese goji berries. These would make a nice addition to the dish as they would provide a bit of fruity sweetness to go along with the carrots. And I love the color. 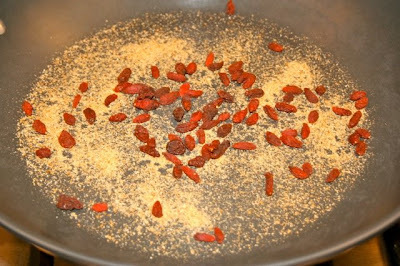 I started with the dashi powder and goji berries in a large pan. 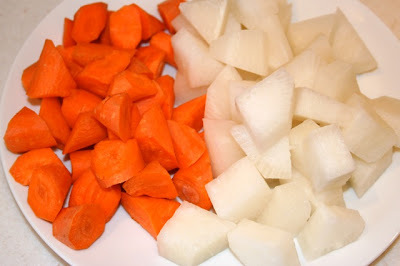 I cut some carrots and daikon into large cubes. These were added to the pan with some water, mirin and soy sauce. 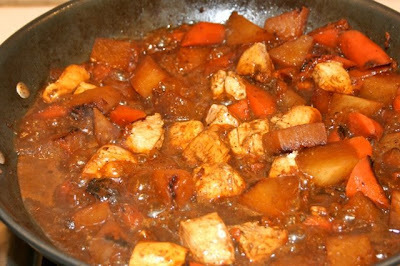 This was cooked, covered, for about 20 minutes until the liquid reduced down and the vegetables were beginning to brown and caramelize. I added some water back ot the pan to make a sauce and threw in some cubed chicken. This was covered and cooked for about 10 minutes until the chicken was cooked through and all the flavors were married together. 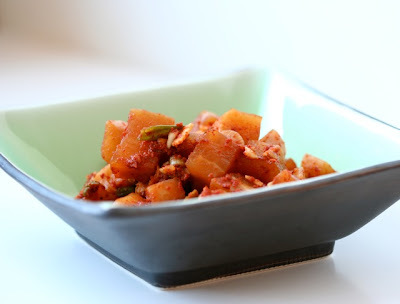 Kimchee is a Korean staple and I really love the crunch of the vegetables and the sweet spice of the Korean red chili. Quite some time ago I posted a kimchee tutorial for making the classic fermented napa cabbage. 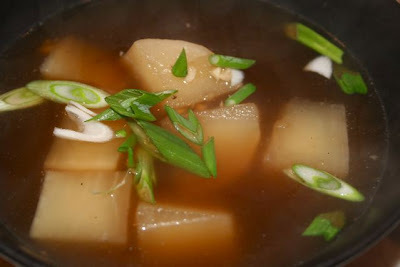 There are many kinds of kimchee in Korea and daikon is another favorite vegetable for pickling in this way. I really enjoy the Korean daikon, which is more round and shorter than the typical daikon you find in most grocery stores. But you can use either for this dish. I actually used one large regular long daikon to make a batch. Two Korean bulbs would be about the same amount. The process I used to make this is similar to the cabbage variant. I diced the radish, salted it and let it sit for about an hour. After a good rinsing the diakon was tossed with one bunch of green onions, sliced; 5 cloves of garlic, chopped, 1 inch of fresh ginger, minced; about half a cup of Korean red chili flakes, and about a tablespoon of nuöc mam fish sauce. I prefer the Three Crabs brand. You don’t want to know how this is made! But it isn’t kimchee without some fermented fish. Traditionally, kimchee is prepared with chopped fish or fermented shrimp. 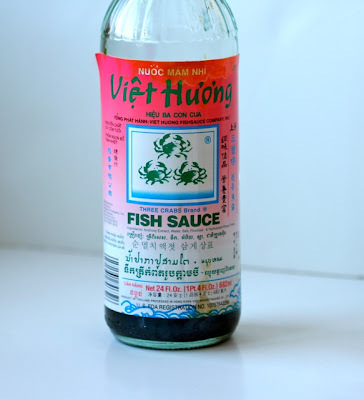 This sauce makes it much easier to add that hint of fish. I also added a pinch of sugar. 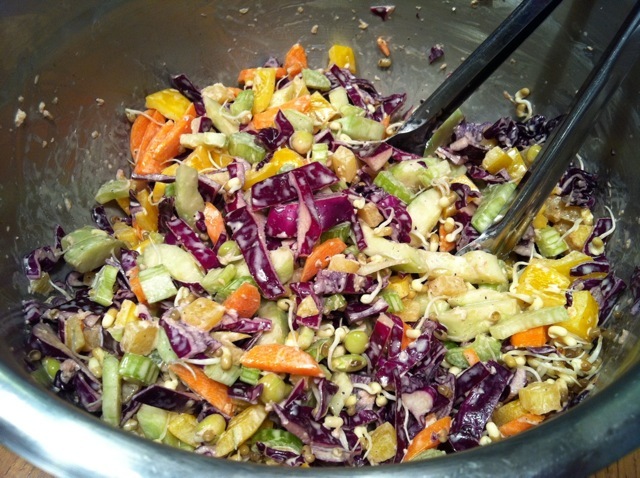 Mix everything well and let it sit out for at least a day then store it in the fridge. Unlike the napa cabbage kimchee, which I like well fermented and sour, I prefer my diakon kimchee fresh and sweet. Dinner this evening came together so beautifully. I knew I wanted to do something with soba noodles tonight but I wasn’t quite sure what. I had on my mind a cold sesame soba dish with some shrimp. But while I was at the market it occurred to me that salmon might be nice tonight. I went over to the fish counter to survey the offerings. I saw what I thought was beautiful wild salmon. 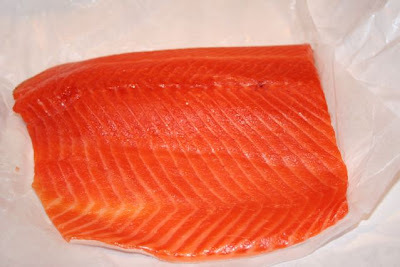 Imagine my surprise when the meat counter staff person told me it was steelhead trout. Trout? I thought trout was more of a white fish. I have never seen trout look like salmon before. Take a look at this gorgeous piece of fish. You can see what I mean. I have never had it before. It smelled fresh and looked fantastic so I bought it. No shrimp tonight! 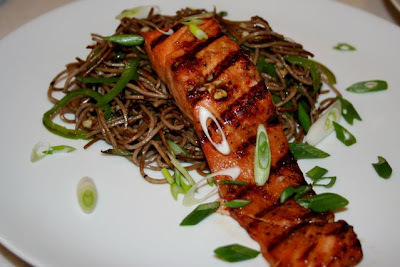 It’s going to be soy, mirin, ginger, and garlic steelhead trout! I also intended to make some soup to go along with the main course for dinner. I still had a chicken carcass in the fridge that I roasted recently. 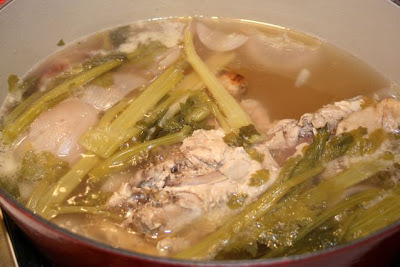 So I made a simple chicken stock by simmering the carcass with celery and onions for about two hours. This is what I ended up with after a couple hours simmering. I strained the broth off and used that as the base of my soup. Keeping with my Asian inspiration I picked up a fresh daikon radish at the market today. I absolutely love cooked diakon. It is so tasty yet mild. 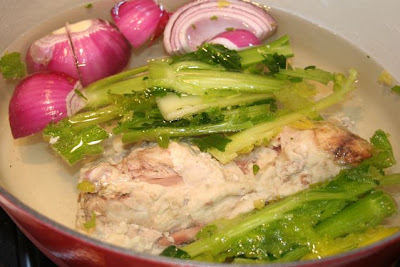 After I strained the chicken stock I placed it back in the pot and added a bunch of large chunks of diakon, lots of chopped garlic, a good amount of grated fresh ginger, soy sauce, a splash of mirin and a tad bit of nuoc mon Vietnamese fish sauce. I let this simmer for about an hour more until the daikon was nice and tender. The soup was perfect garnished with some fresh green onions. Ok, let me get back to the main dish. Yes, the fish! I bought a 1 pound filet and cut it into 4 oz servings. This was marinated with finely chopped garlic, fresh grated ginger, soy sauce, mirin, sesame oil and black pepper. I let this marinate in the fridge for about 40 minutes. The soba noodles were the inspiration for everything tonight so I should tell you how I prepared them. I cooked about 4 oz of soba noodles (2 servings) in boiling water for about 8 minutes until they were tender. These were drained and set aside in the colander for a while while I got the fish cooking. I used a hot grill pan to sear the fish on one side for about minuted then I turned it over skin side down. The pan was placed in a hot 400F oven while I finished up the noodles. I think the fish stayed in the oven for about 8-10 minutes. Let’s get back to the noodles. Once I got the fish in the oven I was ready to fry the noodles. I had a wok heated and ready. I coated the noodles with a bit of toasted sesame oil. I had ready some chopped garlic and finely julienned green bell pepper. I added a tsp or so of canola oil to the hot wok and threw everything in together. This was stirred up together and then spread out in the pan to get a little bit crisp. After a few minutes I would stir it up and then spread it out in the pan again. This helped to brown and crisp the noodles. The noodles were placed on the plate and the fish was laid on top. The dish was garnished with fresh sliced scallions. I must say this turned out better than I expected. 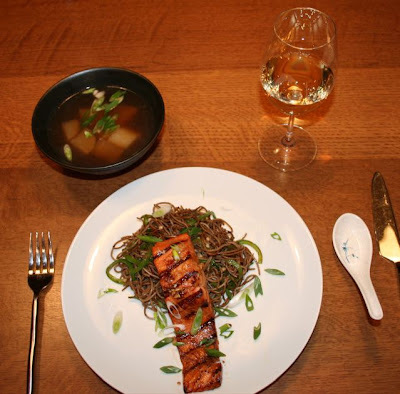 The crunchy sesame soba noodles and the juicy mild fish seasoned with ginger were perfect together. I must do this again. To compliment the meal I had a nice California sauvignon blanc.